The HARPS instrument at ESO’s La Silla Observatory in Chile has been used to make the most complete census of comets around another star ever created. A French team of astronomers has studied nearly 500 individual comets orbiting the star Beta Pictoris and has discovered that they belong to two distinct families of exocomets: old exocomets that have made multiple passages near the star, and younger exocomets that probably came from the recent breakup of one or more larger objects. The new results will appear in the journal Nature on 23 October 2014. Beta Pictoris is a young star located about 63 light-years from the Sun. It is only about 20 million years old and is surrounded by a huge disc of material — a very active young planetary system where gas and dust are produced by the evaporation of comets and the collisions of asteroids. 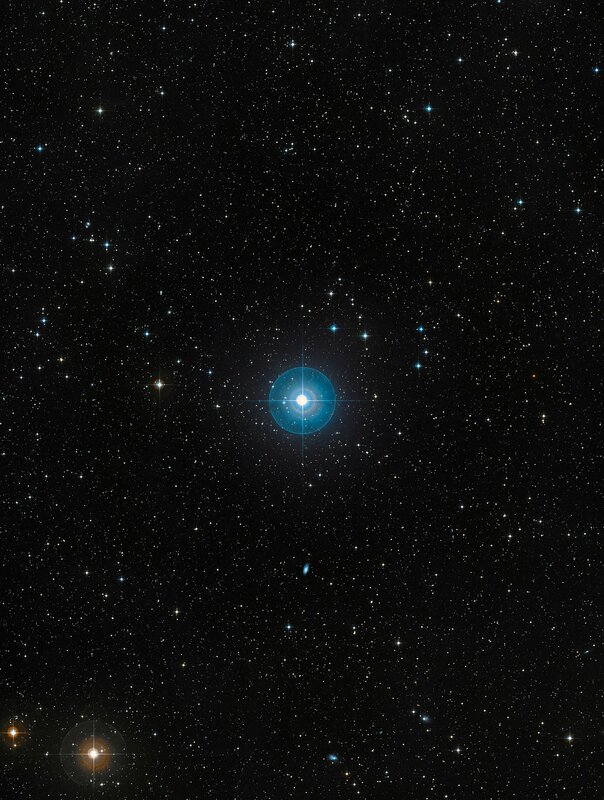 For almost 30 years astronomers have seen subtle changes in the light from Beta Pictoris that were thought to be caused by the passage of comets in front of the star itself. Comets are small bodies of a few kilometres in size, but they are rich in ices, which evaporate when they approach their star, producing gigantic tails of gas and dust that can absorb some of the light passing through them. The dim light from the exocomets is swamped by the light of the brilliant star so they cannot be imaged directly from Earth. To study the Beta Pictoris exocomets, the team analysed more than 1000 observations obtained between 2003 and 2011 with the HARPS instrument on the ESO 3.6-metre telescope at the La Silla Observatory in Chile. The researchers selected a sample of 493 different exocomets. Some exocomets were observed several times and for a few hours. Careful analysis provided measurements of the speed and the size of the gas clouds. Some of the orbital properties of each of these exocomets, such as the shape and the orientation of the orbit and the distance to the star, could also be deduced. 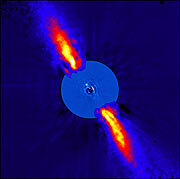 This analysis of several hundreds of exocomets in a single exo-planetary system is unique. It revealed the presence of two distinct families of exocomets: one family of old exocomets whose orbits are controlled by a massive planet , and another family, probably arising from the recent breakdown of one or a few bigger objects. Different families of comets also exist in the Solar System. The exocomets of the first family have a variety of orbits and show a rather weak activity with low production rates of gas and dust. This suggests that these comets have exhausted their supplies of ices during their multiple passages close to Beta Pictoris . The exocomets of the second family are much more active and are also on nearly identical orbits . This suggests that the members of the second family all arise from the same origin: probably the breakdown of a larger object whose fragments are on an orbit grazing the star Beta Pictoris. 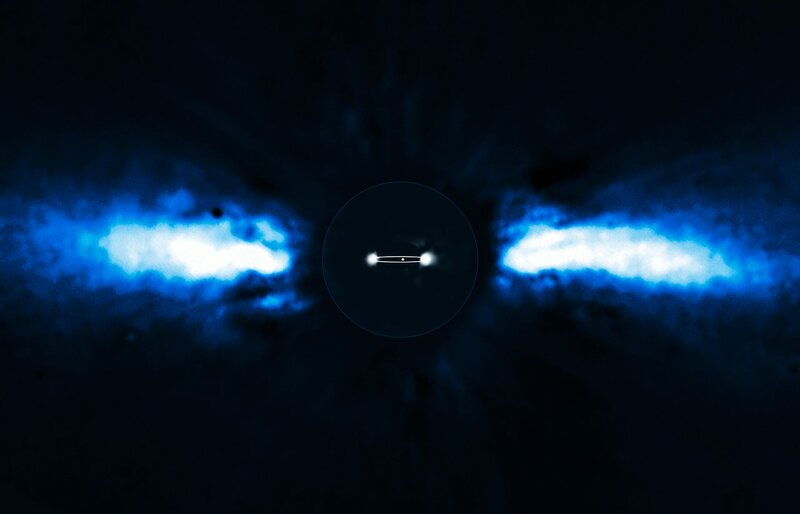 A giant planet, Beta Pictoris b, has also been discovered in orbit at about a billion kilometres from the star and studied using high resolution images obtained with adaptive optics. Moreover, the orbits of these comets (eccentricity and orientation) are exactly as predicted for comets trapped in orbital resonance with a massive planet. The properties of the comets of the first family show that this planet in resonance must be at about 700 million kilometres from the star — close to where the planet Beta Pictoris b was discovered. This makes them similar to the comets of the Kreutz family in the Solar System, or the fragments of Comet Shoemaker-Levy 9, which impacted Jupiter in July 1994. 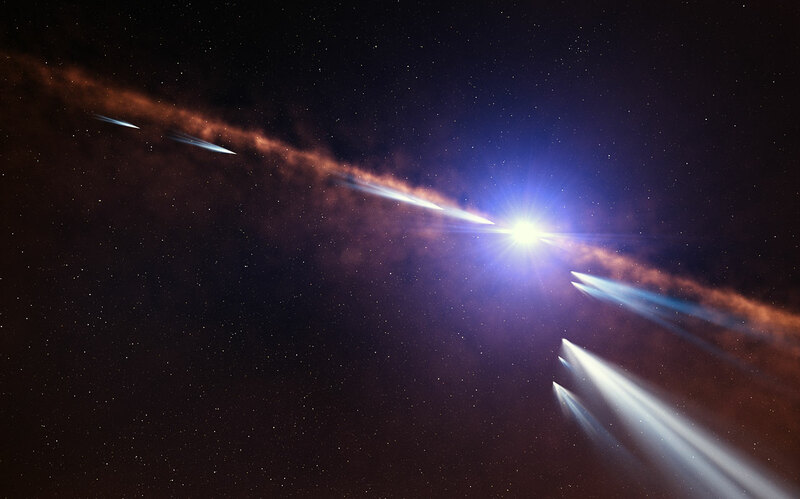 This research was presented in a paper entitled "Two families of exocomets in the Beta Pictoris system" which will be published in the journal Nature on 23 October 2014. The team is composed of F. Kiefer (Institut d’astrophysique de Paris [IAP], CNRS, Université Pierre & Marie Curie-Paris 6, Paris, France), A. Lecavelier des Etangs (IAP), J. Boissier (Institut de radioastronomie millimétrique, Saint Martin d’Hères, France), A. Vidal-Madjar (IAP), H. Beust (Institut de planétologie et d'astrophysique de Grenoble [IPAG], CNRS, Université Joseph Fourier-Grenoble 1, Grenoble, France), A.-M. Lagrange (IPAG), G. Hébrard (IAP) and R. Ferlet (IAP).